This past week, my sister Jessica took care of James as it is childcare vacation week, but both Kelley and I had to work. She wrote this post about her time with James and graciously agreed to let us use it as a guest blog entry. Thank you, Aunt Jessica! 1) Pushing a toy train around a circular track for hours on end is actually pretty Zen, as is digging a hole and filling it in, over and over and over again. 2) I do, in fact, lift from the knees – my legs are killing me from carrying James all week but my back is totally fine. 3) Speaking of carrying James, it turns out that a sprained elbow from a high school injury has the habit of flaring up again, 20 years later, if you spend the week carrying a child. 5) Pushing a stroller with a two (almost three) year old in it for two miles is a lot harder then just walking (or even running) that same two miles. 6) The Faneuil Branch of the Boston Public Library doesn’t open until noon on Tuesdays. 7) Grilled American cheese sandwiches are quite possibly the most amazing things ever invented…no, I don’t care that American cheese isn’t a real food. 8) Thomas and Friends is actually rather entertaining, with some truly catchy tunes that will stay with you for hours and hours and hours. 9) A two (almost three) year old can be solidly distracted by play-doh, bubbles, pink & white, Thomas, trains, and of course, diggers. 10) The Boston Road Crews (the ones who trim the trees from the power lines), and the garbage men of the city are either super friendly, or all have little ones at home because I honestly don’t think we passed a single city employee during the whole week who didn’t take a second to wave to James. 11) The Children’s Museum is exactly as much fun as I remember it to be. 12) The children of Boston, and their parents, are incredibly sweet, well behaved and conscientious of the other children around them…or at least the ones who were at The Children’s Museum on Wednesday were. 13) It turns out a two (almost three) year old boy is fascinated by all manner of bodily functions – pee, poo, toot, burp, you name it – it’s all awesome and hilarious to the child. 14) A water/sand table is pretty fun, not just for a two (almost three) year old. 15) Grapes are better when cut in half and shared with a nephew. 16) Boynton books are awesome but so are a whole bunch of other board books like THE LITTLE BLUE TRUCK and SHEEP IN A SHOP. 17) Two (almost three) year olds can be incredibly bossy and particular…oh, and did I mention destructive, but they can also be the cutest thing on the planet – painfully, adorable – truly. 18) It’s super fun to say things around a two (almost three) year old just to see if he’ll mimic you in his adorable voice. There is nothing quite so hilarious as hearing something like “you can’t handle the truth” or “these aren’t the droids you’re looking for” or “no power in the ‘verse can stop me” out of that adorable and endearing chirp of a voice. 19) If you put down a paper-tape track through the house with the intention of the two (almost three) year old using it to drive his cars around in a circle, know that it will never be used for that intended purpose and instead you will find yourself running around the track in a circle being chased by said two (almost three) year old for a good hour at least – the good thing is that you will not need to do your scheduled 4 mile run that day. 20) There is no limit to the energy of the two (almost three) year old, but a 40 (almost 41) year old runs out of steam about 2 hours into the day. 21) You can, in fact, get a two (almost three) year old to bake his own birthday cupcakes, as long as decorating the cupcakes once they’re cool is in the offing. 22) Magic words are real once the two (almost three) year old realizes that nothing will happen without the most magic word of them all – “please”. 23) The two (almost three) year old is a booger making factory. Seriously, if we could harness that power from all the two (almost three) year olds in the world I think we could end this country’s dependence on foreign oil. 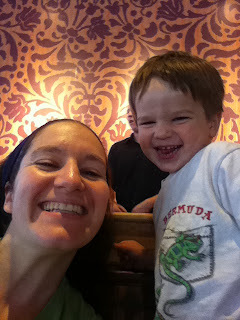 24) Time runs differently when caring for a two (almost three) year old. In fact, I wonder if there’s some sort of worm hole surrounding the little ones that actually changes the laws of physics – have we discovered the true fluidic space? 25) …which leads me to the fact that caring for a two (almost three) year old for a week is a level of chaos that I couldn’t have fully understood until today. Bravo to the mommies and daddies and day care workers and babysitters, the grandmas and grandpas and aunties and uncles who do this on a regular basis. I tip my hat to you all and, though I don’t plan to have any myself, I completely agree that there is nothing quite so indescribably wonderful as hearing “I love you, Aunt Jessica” from that sweet and marvelous little boy. Jessica Ammirati is a director and doula extraordinaire who lives in Brooklyn, NY. The founder of Going To Tahiti Productions, you can find her regular blog posts for GTTP at http://goingtotahitiproductions.com/blog/.